Taħseb li Daniel kien iħobb lil uliedu? Kien missier tajjeb? Taħseb li esaġera fil-mod kif organizza l-party? Għandu missier (jew omm) ikun ħabib ta’ uliedu? Kif? Miranda returns to discover a party she didn’t want, and to demand a divorce she had wanted for years. Kellha raġun Miranda tirrabja? Miranda kienet omm tajba għal uliedha? Miranda lil Daniel tgħidlu “Why do you always make me out to be the heavy?” jiġifieri “Għaliex dejjem tagħmilni nidher kerha (mat-tfal)?” Veru li Daniel kien qed jagħmel hekk? Ried jagħmel hekk? Daniel lil Miranda jgħidilha, “How about we take a vacation, take the kids, get you away from work, you’ll see that you’re a different person. You are. You’re great.” Imma Miranda tgħidlu: “But our problems would be waiting for us when we got back.” Taħseb li vaganza flimkien tista’ ssolvi xi ħaġa? Miranda tgħid lil Daniel, “We’re far apart. We’re different. We have nothing in common.” Taħseb li dan jista’ jiġri f’relazzjoni? X’ikun ġara ħażin? Daniel jgħidilha: “Sure we do. We love each other… We love each other… Don’t we?” Taħseb li dan huwa biżżejjed biex relazzjoni tibqa’ tajba? Daniel discovers the world of divorce law: Miranda gets the kids, and Daniel gets weekend visits. Il-Qorti tgħid “Although these custody proceedings tend to favour the mother, we also realize, perhaps now more than ever, that it is not in a child’s best interest to deprive him or her of an obviously loving father.” Taħseb li t-tfal għandhom bżonn ta’ omm u ta’ missier? Għaliex? Chris jgħid lil missieru “This is all my fault… I should have never had a birthday, Dad. This never would have happened.” Imma missieru jgħidlu, “Yes, it would. It was an accident waiting to happen, OK? You did nothing wrong. You got that?” Qallu sew missieru? L-ulied għandhom ħtija għal dak li jiġri bejn il-ġenituri? While Daniel looks for work, a man with a “real job ” rediscovers Miranda. Natalie, iż-żgħira tistaqsi lil missierha, “Can’t you just tell Mom you’re sorry?” U missierha jgħidilha “Wish I could.You know, grown-up problems…They’re a little more complicated, Nattie.” Għaliex il-problemi bejn il-kbar huma iktar ikkumplikati minn dawk tat-tfal? Għaliex ”li tgħid sorry” ma jkunx biżżejjed? Għamel sew Daniel iċċajta kif iċċajta quddiem it-tfal meta qal, ”I’d hate to thinkthat she came down with amoebic dysentery or piles!”? X’kienet ir-reazzjoni ta’ Natalie? Hija ħaġa tajba li l-ġenituri jillatikaw quddiem uliedhom? Kif iħossuhom it-tfal? Separazzjoni jew divorzju għandhom effett fuq it-tfal? 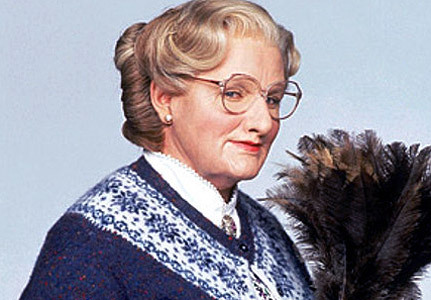 Meta Mrs Doubtfire tfaħħar lil Miranda għall-ordni li għandha fil-kċina, din tgħidilha, “My husband never appreciated it.” Kemm hu importanti l-apprezzament fir-relazzjonijiet? Mrs Doubtfire tgħid “Marriage can be such a blessing”, Miranda tweġibha, “So can divorce.” Veru dan? 18. Meta Mrs Doubtfire tistaqsiha jekk ma’ Daniel qattx tkellmet dwar dan, tgħidilha li le, għax Daniel ma jafx ikun serju? Kemm hi importanti l-komunikazzjoni tajba f’relazzjoni? U s-sens ta’ umoriżmu? 19. Miranda tgħid “I don’t wanna do any more “who did what to whom”. Ever since this happened, I’ve been trying to make sense out of it.” Il-passat jista’ jintesa? Relazzjoni tista’ tissewwa? 20. Mrs Doubtfire ħarġet l-aqwa kwalitajiet f’Daniel, f’Miranda u fit-tfal. Taqbel? Oh my dear Katie. You know some parents, when they’re angry, they get along much better when they don’t live together. They don’t fight all the time, and they can become better people, and much better mummies and daddies for you. And sometimes they get back together. And sometimes they don’t dear. And if they don’t, don’t blame yourself. Just because they don’t love each other anymore, doesn’t mean that they don’t love you. There are all sorts of different families, Katie. Some families have one mummy, some families have one daddy, or two families. And some children live with their uncle or aunt. Some live with their grandparents, and some children live with foster parents. And some live in separate homes, in separate neighborhoods, in different areas of the country – and they may not see each other for days, or weeks, months… even years at a time. But if there’s love, dear… those are the ties that bind, and you’ll have a family in your heart, forever. All my love to you poppit, you’re going to be alright… bye bye. 22. Fl-opinjoni tiegħek, x’għandhom ikunu l-kwalitajiet ta’ omm tajba? Ta’ missier tajjeb? Ta’ iben tajjeb?